There is a new trend in home improvement, and it doesn’t have anything to do with the interior of your home. The creation of outdoor living spaces takes a boring green lawn without any dimension and turns it into a usable space the whole family can enjoy. Not only can homeowners take their backyards and turn them into a functional space, many outdoor home improvement projects increase home value and outdoor safety. There isn’t a one size fits all project to choose when considering outdoor upgrades. Consider your family, the size of the space, areas you want to highlight, and the overall purpose you want the space to serve. If you aren’t sure exactly what you want but you know you are ready to take your lackluster landscape and turn it into something that inspires you consider some of the options below. One of the most common trends for homeowners in climates where the temperatures are consistently warm is livable outdoor spaces. Common design elements for outdoor living areas include an outdoor kitchen, access to water, comfortable seating, a space for games, and some may include an area for television viewing. For many this includes the creation of an outdoor covered patio area or a space that is partially covered. Outdoor living spaces require many of the same elements that are needed within the home such as plumbing, electricity, and gas. Firepits are a popular feature that is often included in outdoor living spaces. Firepits have changed a lot with the addition of outdoor living spaces. Long gone are the metal rings and fires fueled by wood. Instead many homeowners opt to use gas and glass to create a truly unique ambiance. Your landscape should be more than just grass. Create a landscape with a purpose. Create spaces within the landscape using plants, trees, fencing, statues, seating, and such that give the space purpose throughout the yard. This can be done with minimal maintenance required. The last thing most homeowners want is to increase the amount of maintenance required around their homes. Think about your current landscape. Envision the space divided up into several usable spaces. You don’t have to reinvent the space all in one day. Often landscaping with a purpose is done throughout an extended period of time. A great place to start is to choose a space within your landscape to create a seating area that is sectioned off from the rest of the lawn. Create a platform that sits under a canopy of shade trees. Simple platforms can be created out of concrete or bricks, add comfy seating and tables for drinks and snacks, sit back and enjoy. The installation of a backyard swimming pool is another popular outdoor home improvement that is often considered when homeowners want to create an outdoor space that can be enjoyed by the entire family. Swimming pools are a fabulous way to bring people together as well as enhance the visual appeal of your landscape. When a pool is installed the sky is really the limit from waterfall features to diving boards there is something for every homeowners’ desires. The most important element when having a pool installed is safety. Inground swimming pools must have a fence and latching gate that encloses the perimeter of the space. Not just any fence will do either, the fence must meet the standards in place by the B.O.C.A. Aluminum fencing is the most popular option amongst pool owners because it is not only attractive but requires little maintenance to keep it looking as sharp as the rest of the landscape does. Aluminum pool fencing that meets B.O.C.A. standards can be found online at iFenceUSA. Not only are there 18 different aluminum pool fence panels to choose from, homeowners can customize their fence with a number of ornamental features and décor options. Classic black aluminum fence panels are a popular choice for pool owners however, homeowners have 9 different colors to choose from. No matter what fence design is chosen homeowners are sure to make a bold statement with the addition of a beautiful backyard oasis. Another way homeowner can not only create an outdoor space that speaks volumes but also add security is through the installation of a gated entryway. Driveway gates are terrific statement pieces that offer visitors a first impression like no other. There are a number of types of materials used for entry gates however when looking for a material that is durable, long-lasting, and low maintenance, aluminum is once again your go to. Aluminum driveway gates can be installed in a number of ways from attaching them directly to fencing or grand pillars. Homeowners have a lot of options when enhancing their landscape with a driveway entry gate. As you can see there are a number of ways to add purpose and increase the attractiveness of your landscape. The exterior of your home doesn’t have to be boring. With a little bit of thought your homes outdoor space can be turned into something special. iFenceUSA is an online distributor of wholesale aluminum fences and gates for residential, resort, commercial, and industrial installation. As an industry leader in maintenance-free aluminum fencing products we have all your aluminum fence and gate needs covered. More information can be found online at https://ifenceusa.com/. Springtime Is Upon Us: Are You Considering the Installation of a New Fence? The skies are finally letting a little sunshine shine down on us, the chickadees have returned, the cool breeze is flowing through the trees, and the world is becoming a little more colorful; it’s time to get outside and enjoy it. In preparation for warmer weather and your children begging to play outside homeowners begin to think of all of the ways to ensure the safety of their children. The installation of perimeter fencing is often where homeowners choose to begin. Installing an aluminum fence this spring allows you to enjoy your home to the fullest. With the installation of aluminum fencing homeowners can improve the comfort of their outdoor living area which increases the enjoyment of all types of social gatherings. Creating a cozy space where friends and family can gather to play some backyard games and enjoy a BBQ is easy when the social space is defined by an aluminum perimeter fence. Make your backyard the go to spot by installing an ornamental aluminum fence that accentuates the comfort of your space. Your guests can enjoy the sun and stars while relishing in some conversation and laughter in a private outdoor space. The installation of a fence around your property is especially important if you have small children. If you don’t have a fence around the perimeter of your home and property, then it is likely you will worry about them running freely into a road or about strangers entering the yard. With an aluminum fence in place around your yard children can play freely and you will gain some peace of mind. Yes, children need supervision however sometimes parents are interrupted. Having a fence in place ensures that when you turn your head for that split second your children will be safe from running in the street or from being accessed by those individuals outside of the yard. Your children need to release stored, pent up winter energy, a new perimeter fence allows them this freedom. As much as we love our neighbors the last thing we want is for them to spy on our every move, especially when we are enjoying our backyard space. Even though we all enjoy a little time for social interaction with our neighbors we all need a little downtime. An aluminum fence can ensure you can enjoy yours. With the installation of a new fence you give yourself the opportunity to enjoy your space without the concern of outside forces. There are a number of styles, colors, and ornamental options when choosing an aluminum fence for your space. Without a doubt you will find one that exceeds your expectations. DIY Aluminum Fence Installation: What Should I Look for When Purchasing an Aluminum Fencing? Research is a key element in any purchase especially an online aluminum fence purchase. There are several suppliers of fencing so it is careful to do research and search out a wholesale aluminum fence supplier that will ensure success in DIY fencing. Purchasing a perimeter fence and/or a driveway gate is a large home improvement purchase that will be around for decades, it is important that it adds value, security, curb appeal, and is exactly what you desire. What Should I Look for In a Wholesale Aluminum Fence and a Fencing Wholesaler? Can you speak with one service rep from the start to finish of your project? Are the customer service experts qualified? Do they have through knowledge of products and installation procedures? Will they help with the design of your fence? Do they offer both email and phone support? It is important to work with a fence supplier that helps without hassle. When issues arise with your product, installation, repairs, or warranty work it is crucial to have the backing of a solid customer service team. Look for an aluminum fence manufacturer that has a solid reputation within the industry. Again, research, research, research! Determine the longevity of the company. How long have they been in business? Do they have a reputation for a high-quality product? Do they have a solid reputation? Are they know to be reliable? For example, iFenceUSA offers premium fencing that ships factory direct to clients both commercial and residential. iFenceUSA customers can chose from 9 colors, 18 designs, 100’s of options, and so much more when designing a top of the line aluminum fence and gate for your home. Although not the top priority in fencing affordability does come into play when choosing a fence. Aluminum fencing increases in price when choosing higher quality grades. A residential aluminum fence will cost less than an industrial grade fence just because it is manufactured with a higher quality aluminum. When selecting a fence ensure you are comparing apples to apples. Some suppliers will quote residential grade aluminum fence just to quote the least expensive option even when resort or commercial grade aluminum has been requested. If your quote seems to be good to be true, it probably is. 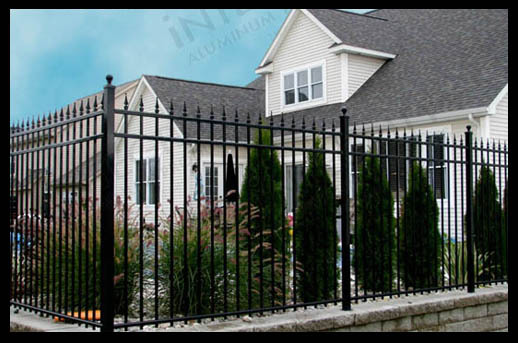 Aluminum fence panel and gate quotes from iFenceUSA come with all the hardware you will need to install your fence. Research is important in any online purchase but especially true in a large purchase like aluminum fencing. When researching your new aluminum fence reach out to the customer service experts at iFenceUSA to see how we can make your fencing purchasing and installation painless from start to finish. There are a number of fencing materials available when searching for a fence for your backyard. There is also a lot of information available to consumers online, much of which is useful however, as with any information gained online you want to make sure it is not based on internet myths. You don’t want to make the wrong decision for your yard and landscape because you were swayed by information that is based on incorrect myths. A widely spread misconception about aluminum fencing is that it is weaker than other types of fencing, including steel and wrought iron. Consumers should not judge the strength of the fencing material based on the weight of the fence. This is an inaccurate representation. Aluminum is highly durable and also tends to be lighter in weight than wood, vinyl, and other fencing materials. The lightweight nature of aluminum is a bonus, not a negative. Aluminum fencing is an affordable option. Often consumers only take into consideration the initial purchase of the fence panels however, it is important to consider the upkeep costs of fencing as well. The initial purchase of aluminum fence panels can be a little bit more expensive however there is absolutely no cost involved with maintenance unlike all other fence materials. Wood fence requires yearly staining which can add considerably to the cost of the fence. Aluminum fencing is in fact one of the longest lasting fence materials available on the market today. The powder coated finish on aluminum fence panels and gates is weather-resistant which ensures a long-lasting fence. Wooden fences tend to require more maintenance than aluminum and do not hold up well in harsh weather conditions. There are a number of colors and decorative aluminum fence styles to choose from when working with a company like iFenceUSA. Consumers tend to picture basic, black aluminum fencing when considering options for their home however, this is far from where aluminum fence options end. There are a number of options that can be added to aluminum as well. It is in fact one of most customizable materials in fencing. Pool safety has become more of a hot topic in recent years. Children are naturally drawn to the water which can be a problem when unsupervised outdoors. On average over two hundred young children each year drown because of backyard swimming pool accidents. With the prevalence of swimming pools within the last ten to fifteen years an emphasis on regulating and implementing safety requirements is being seen across the United States. Pool safety regulations, including the installation of fencing, have saved a number of families from experience loss through accidental drowning. There are three options pool owners have when it comes to installing permanent safety fence for swimming pools including: aluminum fence panels, vinyl, and wood. Below we will discuss the advantages and disadvantages of all three types of permanent swimming pool fencing. 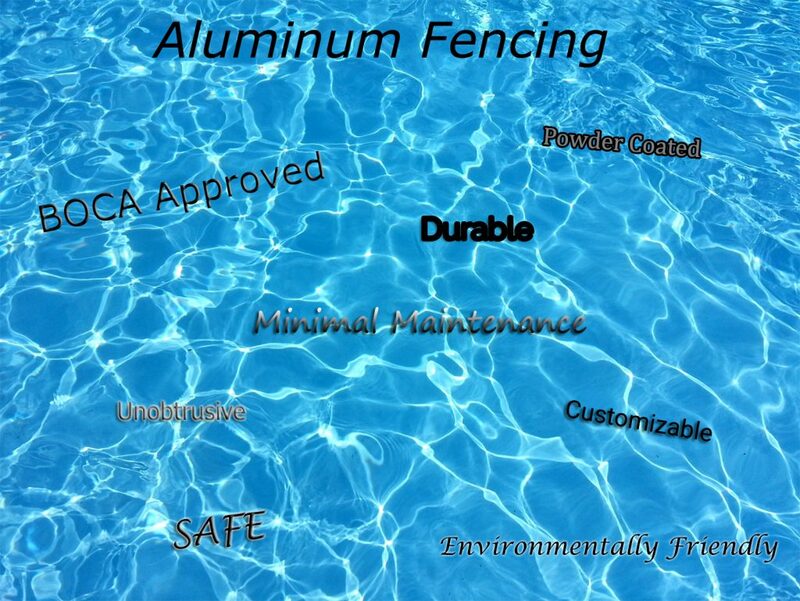 The most popular material in permanent pool fencing is aluminum in part because it is durable, low maintenance, and aesthetically pleasing. Aluminum fence panels are coated with a powder coating which offers extreme durability, little to no maintenance, is environmentally friendly, and comes in a number of color and ornamental options that compliment all landscapes. Wrought iron, although similar in look, is not used around swimming pools as it is more expensive and difficult to maintain, especially from rusting. Residential aluminum fence panels traditionally come in six-foot sections although can be customized into shorter or longer panels if needed. In order to be BOCA approved the aluminum fence that is installed around your swimming pool must be at least forty-eight inches in height, horizontal railings must be at least forty-five inches from the bottom rail to prevent climbing. Decorative aluminum fencing is perfect for pool fencing when homeowners are looking for an option is pool safety fencing that is low maintenance. It is also a great option for those that wish to see within the pool area from outside of the pool. This works well for families with small children as a parent can visually see children playing outside of the pool in the backyard while supervising children in the pool. The most popular option is black aluminum fencing however is offered in 8 colors and a number of decorative styles to choose from. Vinyl is another option that can be used for pool safety fencing. There are two options including solid privacy fencing and picket fencing. Some vinyl panels include lattice or spindles at the top for a decorative accent. Wood is a popular option in fencing. Wood has been an available option in fencing for decades. Wood requires a great deal of maintenance when used as pool fencing. It is a low-cost material that is highly customizable that is a viable option as a permanent pool fence when homeowners are willing to do the work to maintain it. Nothing is better than adding to your homes curb appeal while increasing privacy and security. There are a number of aluminum fence and gate styles to choose from which are far more appealing than styles of the past. One of the best elements of aluminum fencing is the ability to be able to choose the grade of fencing from residential to industrial. Thus, making aluminum fencing every bit as strong as you desire with unlimited customization options. Aluminum driveway gates and complimentary aluminum fence panels are a perfect addition to any home. What Style of Aluminum Fencing Is Right for Your Home? It is not often that you find yourself shopping for an aluminum fence, is it? The number of styles, features, and options to choose from when customizing your fencing choice. The aluminum fencing of today is far superior to old metal fencing of the past. By choosing the right style, accents, and complimentary features an aluminum driveway gate and fence can completely transform any property. There is a wide selection of aluminum fencing and driveway gates online, so it is simple to find a style that will enhance the exterior of your home. 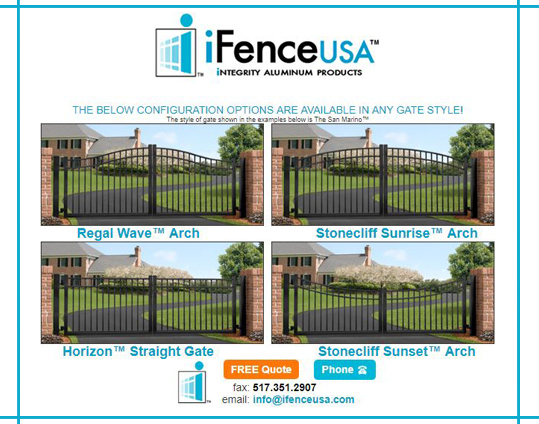 iFenceUSA.com offers 18 different styles to choose from, in nine different colors, with hundreds of options to choose from to enhance the look, feel, and usability of your new fence. Aluminum pairs well with all different style of siding including aluminum, stone, brick, stucco, wood, and more. If your desire is to add grandeur, consider the addition of decorative post caps or an ornamental picket style in classic black. Ornamental aluminum fence designs are ageless and well perceived when installed in both residential and commercial settings. 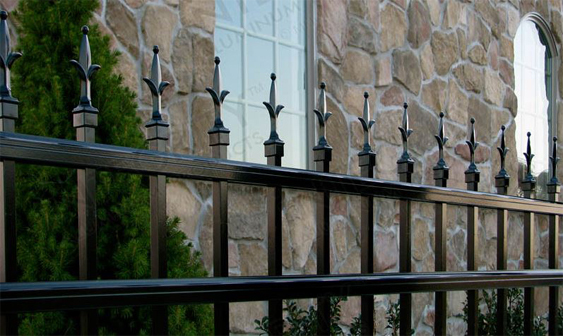 Wrought iron was incredibly popular and the appearance is often sought after in the look and feel of a fence now-a-day. Aluminum fencing can achieve a Victorian era wrought iron fence appearance with ease with the installation of fence embellishments. Achieving this look and feel with wood can be limited and steel can be expensive, aluminum is lightweight, affordable, and easy to install. Choosing an aluminum fence style doesn’t have to be difficult. You can narrow down the options by identifying exactly what you want your fence to accomplish. Are you looking for a more decorative fence to spruce up the space or are you looking to add privacy? Is the installation of a driveway gate and perimeter fence needed as a form of security to keep people outside of your space while keeping your kids/pets secure within the property? Once you have identified your priorities you will easily narrow down the perfect style aluminum fence panel. Aluminum fencing and entry driveway gates not only come in a variety of styles, colors, and offer a homeowner a great deal of functionality. The online, aluminum fencing professionals at iFenceUSA.com can help you through the entire process from measuring, planning, ordering, installation, maintaining, and more. What does the American Dream look like to you? For most the answer has quite simply revolved around the vision of a two-story home with a white picket fence enclosing a private acre of land where the children and dog can play without a care in the world. The white picket fence symbolizes both wealth and achievement. Their popularity rose during colonial times and has continued to be recognized as such today. It is important to note though that long gone are the days where families worked to construct and paint each picket of their fence year after year. Time is just not what it used to be. Time is a commodity that many families just don’t have enough of. The last thing families want to do is to spend a weekend cleaning and painting a fence. Thus, the popularity of white aluminum picket fencing. There are a variety of benefits to be found from installing an aluminum fence but the one that seems to resonate over and over is the lack of maintenance required. Aluminum fence panel maintenance is as simple as running a garden hose over the fence once a year and scrubbing any areas where stubborn dirt or mold has built up with a mild concentration of soap and water. That’s it! Your white aluminum picket fence will look as good as the day it was installed. When looking to add the quintessential white picket fence to your landscape it doesn’t have to come at the great expense of your time. Aluminum fence panels come with a powder coating that protects the material from the forces outside of your control such as moisture. Although aluminum is a metal fence it doesn’t rot, and the powder coating prevents water and moisture from causing problems later on down the road. If a white picket fence is a bit too “American Dream” for you or it doesn’t seem to compliment the style of your home don’t fret. 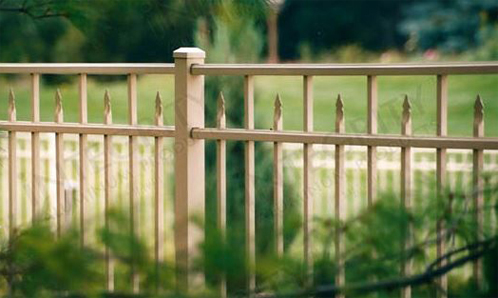 Aluminum fencing comes in a variety of colors, styles, heights, and widths. Another major advantage is that aluminum fence panels offer matching styled driveway gates for added grander. No matter what you picture, aluminum fencing can deliver. From white aluminum picket fencing to contemporary black aluminum fence panels with a matching entry gate, you are guaranteed a secure, low maintenance fence that can stand the test of time in a variety of climates. Do Aluminum Driveway Gates Need To Attach To a Fence? Homeowners should understand that although many times a driveway gate is attached to perimeter fencing it doesn’t have to be in order to be effective. There are a number of ways in which an aluminum driveway gate can be installed. Matching a fence to the entrance of the driveway can be preferable however is not necessary. There are a number of options in driveway gate installation to ensure it is not only aesthetically pleasing but also sturdy and purposeful. The main purpose for installing an aluminum entry gate is to eliminate access to your home via the driveway. Just as the main purpose for aluminum fencing is to add a barrier of protection. It works both ways, fence and gates not only keep unwanted individuals out of your space, they work to keep the ones you want in. No two driveways are the same. Driveways come in a variety of shapes, lengths, widths, and even terrain. The placement of your home’s entry gate is up to you. Some homeowners choose to put the gate at the end of the driveway, near the street, while others choose to place the gate up towards the house. The placement of your driveway gate will depend on your preference and landscape. Not only is a driveway gate aesthetically pleasing adding to the curb appeal of your home, it is helpful in creating a barrier between your home and the outside world. Curb appeal is an important element in real estate. The outside of your home gives buyers a glimpse on what they can expect on the inside. Driveway gates bring a space all together and help to present an entrance that is welcoming while securing the property. Aluminum driveway gates and fencing are just one way that homeowners use to separate their private space from the surrounding public space. This helps to create a secure boundary that also deters thieves. Seriously, breaking into a home is a lot easier when a thief doesn’t have to penetrate through an aluminum fence or driveway gate. If you don’t have an aluminum fence to attach a driveway gate to, don’t fret. There are a number of ways in which an entry gate can be attached other than to a matching fence. 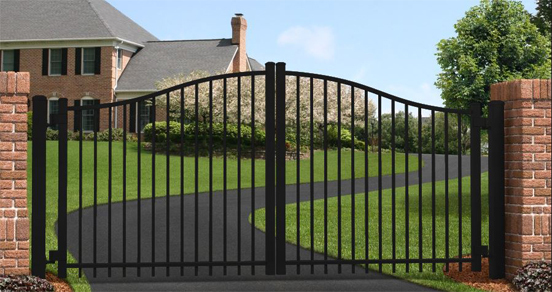 Driveway gates offer additional security to homes even when a fence is not in place. A large entry gate can appear quite intimidating. If your landscape is not set up so that your entrance gate can be attached directly to aluminum fence panels another option to consider is the installation of stone or brick columns on either side of the driveway. This is another aesthetically pleasing option when installing a driveway gate. Stone or brick columns add another dimension to the landscape. When installing a sliding or swing gate choose a style that compliments the existing space while adding a little flare to make an overall statement. The end goal is to find a gate that presents a cohesive look and feel to your home and property. Why Choose Aluminum Over Other Fencing Materials? Without a doubt aluminum is the best option in fencing. The pros will outweigh the cons in a battle between aluminum fencing and all other fencing materials, every time. Not only is aluminum the strongest metal fence, it is affordable, easy to install, and is requires minimal maintenance to keep it looking as good as it did when it was delivered. There are a number of fencing materials to choose from in both commercial and residential settings, but none are as resilient as aluminum. It is a material that has been created to withstand no matter how little or how much it is used. If you are worried about how it will withstand your specific climate, don’t be. 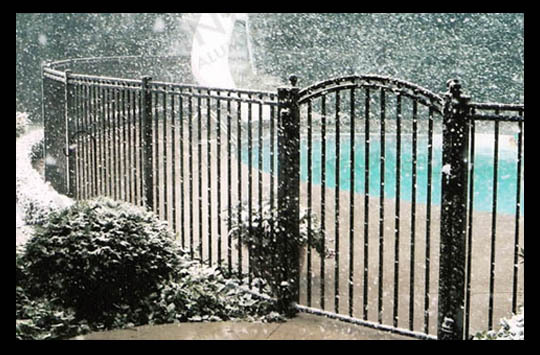 Aluminum fences, aluminum gates, and aluminum driveway accesses are guaranteed to withstand the elements. The panels are finished with a special powder-coating that makes their finish fairly indestructible. Powder coated aluminum panels stop moisture, debris, chlorinated water, dirt, and other hazards from harming the metal as well as the surface. Thus, both fencing and gates appear new even after having been installed for years. Why Aluminum Is Better Than Subpar Fencing Materials? There are plenty of other fencing materials that people could choose but those some with a myriad of disadvantages over aluminum. Wood is beautiful, there is no denying that. The disadvantages of wood however run the gamut: it is quick to rot, requires time consuming maintenance on a yearly basis, and is not necessarily strong. Chain link is far from attractive or secure. Its main purpose is containment verse aesthetics or security. Why Aluminum Is the Best Fencing Material for Varied Climates? It is important that the material you choose for fencing and gates can hold up under any type of weather that it may endure. Whether it be strong wind, heavy rain, hail, snow, chlorinated water, salt water, freezing rain, humidity, dry arid air, or whatever else can be thrown at it, aluminum can withstand. Aluminum comes in four grades: residential, pool/resort, commercial, and industrial. The strongest being industrial. Industrial grade aluminum fence panels are the heaviest and most indestructible of options both commercial and residential users can choose from. Choose the grade that is most acceptable in your application. Why aluminum Is the Best Material in Fencing Against Unwanted Visitors? The reason most often given for installing a fence is security. A fence provides the ability to keep animals and kids contained as well as keeping unwanted people and animals out. The benefit with aluminum over other fences is that it makes entry into the area difficult. Aluminum is not easy to scale, pushing it over is not probable, and additional pickets can be added to decrease the space between the pickets for added privacy. Aluminum fence panels can be ordered in a number of widths and heights as well which adds to the security it provides. The installation of a fence, gate, and driveway entry gate don’t just enhance the aesthtics of your property. They add an element that is similar to your home’s front door; it welcomes entry to those you want and provides security against those you don’t. Installing fencing in locations that blessed with slopes, hills, or any tricky landscape feature can be a challenge. Whether you are searching for ways to keep your home and family secure or you just want to add a little privacy to your space don’t let a few complicated yard elements stand in the way of you and your new fence. Erecting a fence can be difficult when there are unique characteristics in the landscape of the space you wish to utilize. You may have large rocks in the way of a fence post. Perhaps you desire to install a fence in a commercial setting, but you also need to make sure you leave space for parking and driveways. Sometimes a fence needs to be installed on an incline. Aluminum fencing can meet the challenge that any landscape throws at you. A landscape with lots of different land elevations is the trickiest of all to install fencing on. Not every type of fencing can handle various grades however, aluminum fence panels are manufactured in a way that installation can be done with great ease. One of the biggest benefits that come with aluminum fencing is that the pickets are vertical and can easily be manufactured to consider the changes in grade throughout the landscape. Raked fencing is the phrase that fence manufacturers in describing pickets that can be adjusted for the slope of the landscape, while keeping bottom railing parallel to the ground. A mistake that is commonly made by homeowners is installing the posts and fence panels on a slope instead of adjusting the fence panel to the slope. Aluminum fence panels should be parallel with each being installed right next to one another. When planning for and ordering your aluminum fence, gate, and accessories it is important to choose the correct heights and adjust for various slopes, hills, and valleys in the yard. The height of the fence panels that are ordered will differ depending on where in the landscape they will be installed and the landscape imperfection that is found. Stepped fencing is another way in which unique landscapes can be addressed. Stepped fencing is when aluminum fence panels are installed right next to one another, with the tops making a step design instead of being parallel with one another. When stepped aluminum fencing is chosen over rackable fencing the bottom panels may create a triangular gap where the fence doesn’t completely reach the ground. The stacked aluminum fencing option doesn’t work if you are trying to enclose a space to keep small pets from escaping. Consider the goal for fence installation when determining if stepped or rackable aluminum fence panels are is the right option for your landscape needs. Tight spaces and corners are not an issue when fencing with aluminum. Even narrow corners can be fenced with ease when installing aluminum fence panels. This is accomplished in two different manners, one through bypassing the corner all together, the other by stopping the fence a little short. It is important to make sure that there is not too much space between posts on these tricky corners as it can be off putting aesthetically. The vertical pickets have a way of pulling together the look of fencing even with the trickiest of tight spaces and corners. No matter the situation or layout of your yard or landscape setting we have a solution for your needs!